So, my family has given up on rescheduling xmas, which means I could give everyone their gifts at last and finally blog about them! In truth I kind of did blog about them… remember the hand towel? 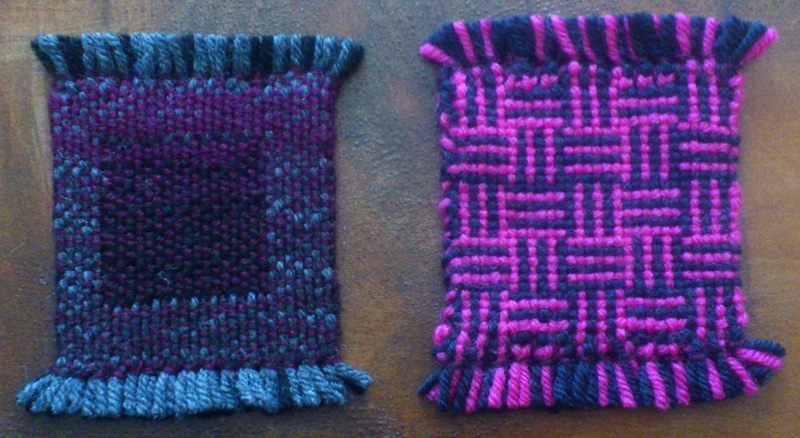 And those two double weave examples I talked about? Yep, them. I actually did two of each and the second ones are a bit squarer and neater and the beat is more even than shown here, but you’ll have to take my word for it because I managed to delete the photos I took of them!! So, you can see the outcome of the two double weaves. For the log cabin it produced a really nice dotty stripe on the back, as a result of a plain warp with log cabin weft. 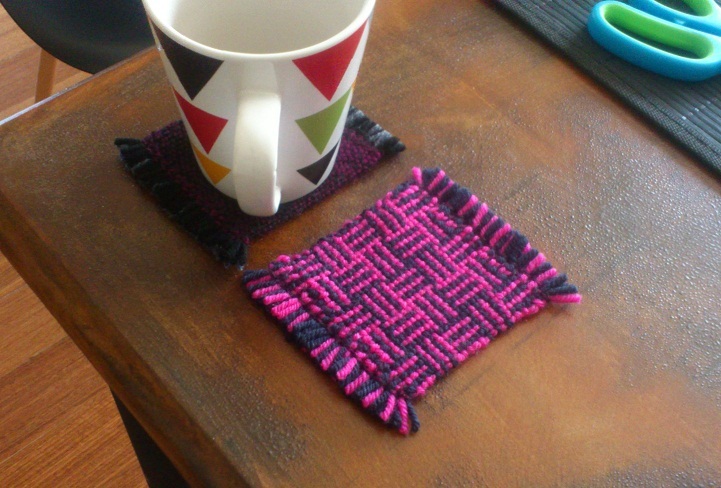 In the other coaster you can see how the black and grey warp threads have been swapped between layers to create the contrasting square in the middle. And here is the ‘action shot’ of the hand towel, though I trimmed that fringe back after this was taken. The towel went into a darkroom/workshop as intended, and is adorning a wall there, but is apparently suffering from “too nice to use” syndrome. The fate of many a practical woven gift, I think! Well, it looks nice. So, in my previous posts on double weave on a rigid heddle loom I’ve talked about having two pick-up sticks in use and that you use one when weaving the lower layer cloth and the other when weaving the upper layer of cloth. What I haven’t detailed is how you get them in position! That’s your first stick in place. Then put both rigid heddles in the up position and pull the first pick-up stick toward the heddles. This will make a lower shed (behind the heddles) and you just pop your second pick-up stick into that shed. Remember the top stick is used when weaving the top layer and the bottom stick is used when weaving the bottom layer. Both sticks are pushed to the back beam when not in use. Threading four shafts on your loom for double weave is different from threading a four shaft pattern, because in double weave two shafts weave the top layer of your cloth and two shafts weave the bottom. The most immediate difference is with e.p.i., as only half the warp ends are used for each layer – i.e. if you threaded your loom at 12 ends per inch you’d have 6 ends per inch in each layer of cloth. In other words you use double the sett you normally would for that yarn. On a multishaft loom you need to watch how you thread and watch which shafts are raised and which lowered so the two layers of cloth don’t get caught together. On a rigid heddle loom (I think) sett is simpler for double weave. Why? Well using two rigid heddles to get 4 shafts means you automatically double your sett, so the fact you only use half the e.p.i. on each layer cancels out the initial doubling! In other words, you just use rigid heddles of the size you’d normally use for that yarn. Using two rigid heddles also means you can clearly see your treadling – one rigid heddle will go up to weave the top layer and the other will go down to weave the bottom layer. The two pick-up sticks, that allow you to move your slot threads, are also easily seen to belong to the upper or lower layers as one is literally on top of the other at the back of the loom. Begin with four warp threads in each slot; two each for your upper and your lower layers (see the left hand diagram below). 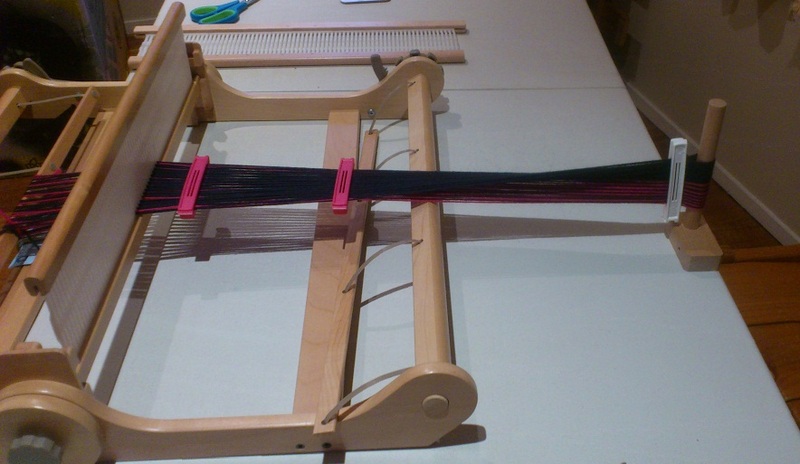 If you warp directly onto the loom, you’ll probably do this first step then, but if you use a warping board, simply see this as stage one of threading. You then take one of the upper layer threads out and put it through the front hole to the right and take one of the lower layer threads out and put it through the back hole the left (shown on the right below). Add your pick up sticks and you’re ready to go! A few months back I started talking about double weave and used some pictures of the early stages of a cushion cover, but I never followed up with a post about the cushion cover! Well, better late than never. 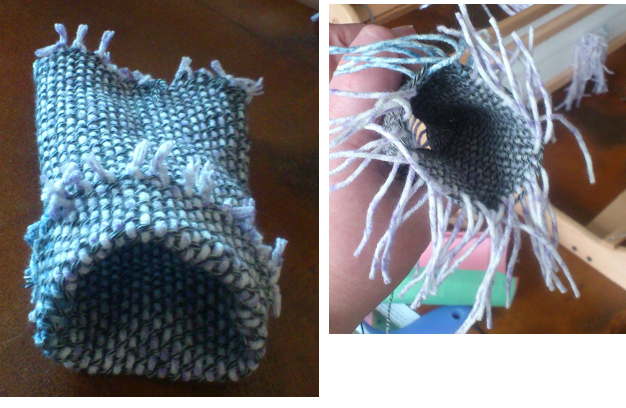 So, I was aiming to weave a cushion cover for an existing cushion and overall the cover came out well. There were however some stunning problems, which I’ll mention in a Bloopers post. For now I’ll stick to what worked. 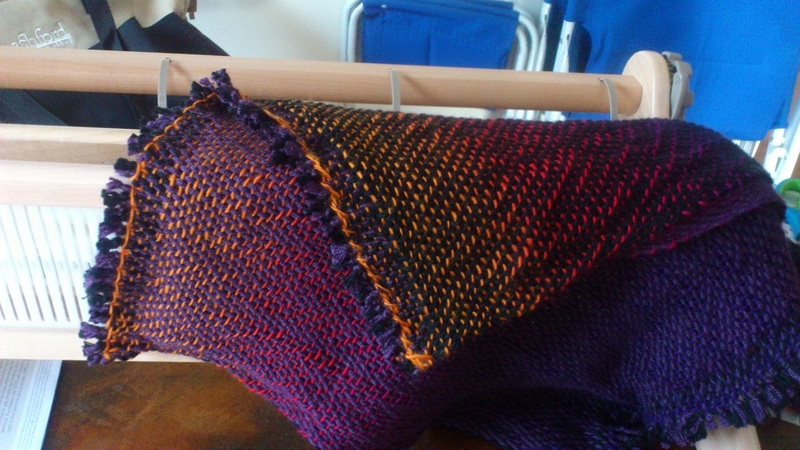 The goal was to weave it so it had the same variegated weft running over both sides of the cushion, but the warp would be black on the bottom and purple on the top. This worked really well. It also made threading the double weave easier and I highly recommend different colours for your upper and lower warp as you do your first double weave project. To explain… starting at the lefthand edge, I wove a pick of my top layer, carried my weft around the righthand edge to weave a pick of the bottom layer and then did the same in reverse. 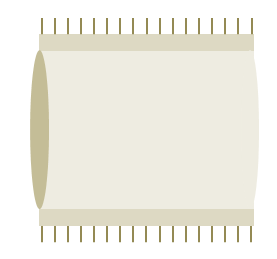 Carrying the weft between the top and bottom layers on the right, closes that edge. The left remains as two separate selvedge edges. I closed the bottom and the top, by treating both my rigid heddles as one unit (lifting / lowering them together) for a few picks. This makes a single, dense layer of cloth for just those picks and a perfect seam! This way when I took the cloth off the loom it only needed finishing of the warp ends, and to be turned inside out, to be ready to use. Though I might have added a little closure for the open edge to keep the cushion in place if things had gone to plan. One thing to note about the way I wove this is that, if I hadn’t woven closed the top and bottom edges, it would have unfolded to give a single piece of cloth, double the width it was on the loom. 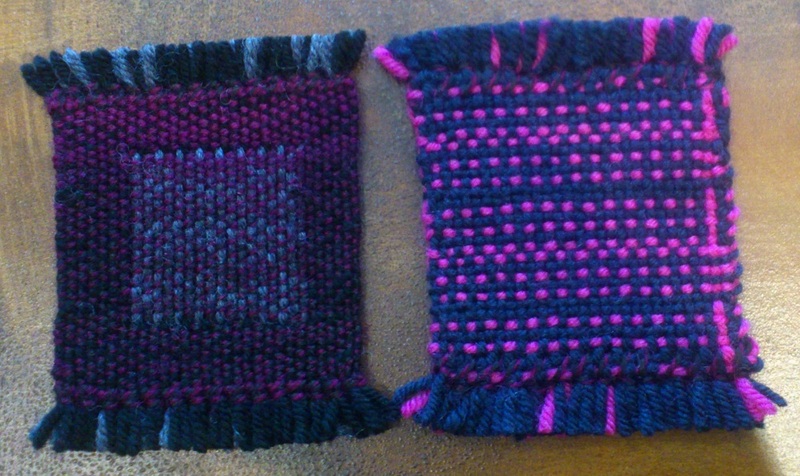 Half would have been purple and half black with the variegated yarn running the full width. The patterned piece has log-cabin on the top layer and a stripe on the bottom. This led to me trying a few new things, including threading front-to-back. Crossing is kind of a feature of threading log-cabin on a rigid heddle loom if you direct warp, and doing that with another set of threads for the other layer of my double weave seemed like it would make a big mess. So I figured if I threaded the loom front-to-back and then wound onto the back-beam, I’d have lovely flat threads. It actually worked well. First up, I direct warped like normal and then put some Ikea bag clips to work to hold the threads ‘in order’. Then I cut the threads from the back-beam and pulled all the threads clear of the rigid heddle (I only had one in place when I warped, for simplicity). I then added the second rigid heddle and threaded them. Finally, I tied onto the back-beam and then wound the warp on, under tension, removing my clips as I went. Then I tied onto the front-beam like normal. So, it was a bit sort of backwards, but it did exactly what I wanted. Nice flat threads! The idea for the second doubleweave piece is that you begin by weaving two layers, each with a different coloured warp and then ‘swap’ the warps part way through. How does this work? In this little diagram, the bit on the left shows how doubleweave works; i.e. there are two separate sheds and in this case the top and bottom layers are different colours. This means you see just one colour on top while you weave, as shown by the lines to the right. 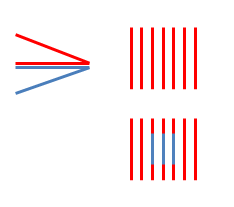 When you bring the lower warp up to the top, you then see the other colour, as shown by the blue in the middle of the last part of the diagram. This is damn hard work on an RH loom because you have to manually pick out the warp to bring it to the top for half the picks. For the top layer that’s just a bit time consuming, but for the bottom layer it’s kind of mind-bending! I’ll pop some photos up of this soon. In fact I wove a couple of tubes. It may be my new obsession. It’s an awful lot of double weave fun! So, what creates the tube-y magic? Well, it’s pretty simple; you weave the top layer, then the bottom layer, then the top layer and finish with the bottom layer again. Basically you weave a circle. This creates a join on both edges and voila, a tube. I will get into more detail about this in another post, but for now I’m just thinking of all the things I can do with tubes! Posted on November 9, 2015 November 9, 2015 Categories learner weaverTags double weave, tubes1 Comment on I wove a tube!